Hempies du Toit was no push-over in his rugby-playing days, and neither are the wines that he makes at his Stellenbosch farm called Annandale. Christian Eedes interviews. There’s more to the story than that. The Springbok tour of New Zealand was the topic of much political contention, with many taking the view that by permitting it, the New Zealand government was providing tacit support to the apartheid regime. Throughout their time there, the Springboks were to encounter public protest, the night after the first test played in Christchurch being no different. The team was quartered in squash courts near the ground, and the order to assemble was precipitated by a tip-off that activists were approaching. “Sportsmanship means being a good loser,” says Du Toit about his carousing with the opposition. “I felt done in. 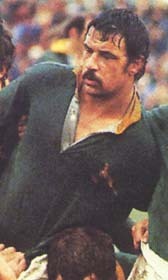 I decided that I would play such good rugby that there could be no doubt that Hempies du Toit was the best tight-head prop in the country.” When a South American composite side toured South Africa the following year, he had regained his place in the starting line-up, and would go on to earn five test caps in all. One of the legendary hard men of South African rugby, Du Toit made his provincial debut for Western Province in 1979 against Northern Transvaal at Loftus Versfeld. “I was sent straight to the cooler box [a time behind the poles for foul play],” he chuckles ruefully. “The crowd bombarded me with naartjies, so I just picked them up and ate them.” He would earn 66 caps for his province, his last game in 1987. Du Toit is as much renowned as a winemaker as a rugby player. His father Piet took over at Stellenbosch farm Alto as part-owner and winemaker in 1959, with the six-year old Hempies in tow. “Growing up on Alto brought me unbelievable joy,” he recalls. By 1976, he was helping Du Toit Snr with the winemaking duties and when his father retired in 1983, became manager and winemaker fulltime at a farm that is famed for its Cabernet Sauvignon and a red blend simply called Rouge. Contrary to conventional practice, Du Toit likes to delay the release of his wines and the Cabernet Sauvignon currently on sale is from the 2001 vintage. “It was a tradition at Alto never to release a wine younger than six years from vintage, and I’m following that here.” He admits that this hinders cash-flow, but says he’s “not in it for the money” and that the appreciation he gets from his clients who enjoy drinking wines a little older is also a form of reward. “My wines are like my children. I like to see them grow up but I don’t like to see them leave home,” he says on a sentimental note. The Annandale flagship wine is the Shiraz 2003. Total production was 1 000 cases and it was released in April this year, selling for R180 a bottle. This spent four years in 100% new French oak, and is about as robust and muscular as the person who made it. At the time of writing, Du Toit was also about to release a special-project Shiraz from the 2002 vintage, which spent five years in barrel, done to honour the five generations of winemakers in his family. He intends selling this wine as a collector’s item in three-bottle cases, with an asking price of somewhere between R1 000 and R1 500 a case. This is especially not for the faint-hearted, but neither are Springbok-All Black test matches. . .
Du Toit also makes a Cape Vintage Port, intriguing in that it is made entirely from Shiraz, not a variety that is traditionally associated with this sort of wine. The 2003 vintage is currently available at R150 a bottle and, although not unappealing, drinks more like a red dessert wine than a full-blown Port. Annandale is purported to be the oldest farm in the Helderberg Valley with the Dutch East India Company’s Governor Simon van der Stel having granted title to Jan Wismaar, the property’s first owner, in 1688. The farm was for a long time known as Brakelsdal, until in the early 1800s, the then owner fell in love with a girl from the Annan River Valley in Scotland, and changed the name of the property accordingly. The Annandale label carries a motif of a horse, and Du Toit relates that before he bought the property, it was a riding school and haven for abandoned and abused horses. Along with a myriad dogs, visitors to the farm will be greeted by Du Toit’s very friendly miniature horse. Much about Annandale evokes a time when winemaking was less commercial. The buildings are charmingly ramshackle but that’s not surprising as they include a cellar which predates 1700 and a manor house built in the middle of the 1700s. A river runs through the property flanked by trees planted in the late 1600s as a result of Governor Van der Stel having mandated that any tree cut for homestead purposes needed to be replanted. And over all this presides Du Toit, who describes his farm as a place that is “good for people, animals and nature”. He delves into his personal wine collection to provide me with a bottle of Alto Cabernet Sauvignon 1971 to commemorate my birth year, and remarks, “Wine is not about monetary wealth but about wealth of life.” Sadly, an increasingly unusual sentiment these days.